“You have your head in the clouds!”, my mother used to say. As a young boy I was a dreamer. I was also the tallest kid in the classroom, so the expression was somewhat lost on me at the time. I thought my mother was just talking about my superior height, not about my daydreaming. So I continued to dream. Dreaming I was a pilot, dreaming about living in the wilderness, dreaming about… you name it. Until someone told me when I started wearing glasses at the age of 8 that being a pilot was out of reach. So I dreamt of other things. Funny enough, I never dreamt of becoming a programmer or IT specialist. Probably because that didn’t even exist fifty years ago. Last weekend I had my head in the clouds again. 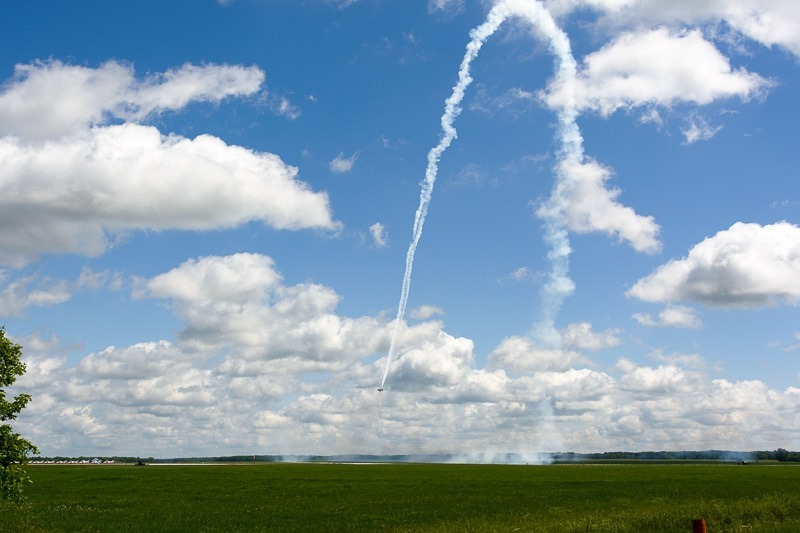 The first air show in 10 years in Manitoba. I was debating myself if I should go or not; I decided around 9:30am that I should give it a try. I should have left Winnipeg around 5am for this to be successful. 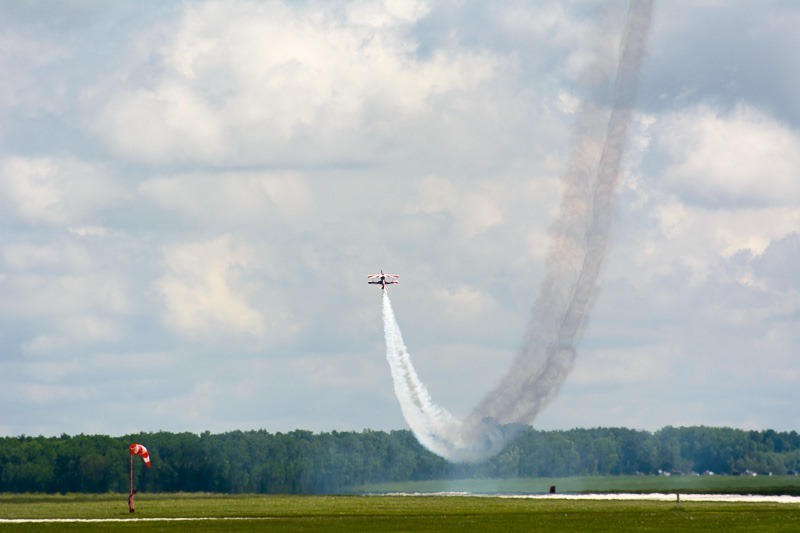 Once I arrived about 15km before Portage la Prairie, there was a sign telling me to turn left for the Airshow. So I turned left onto the indicated road. A few kilometers in, I was stuck. And stayed stuck - for 30 minutes. During that time I must have advanced at most 300 meters. That’s when I decided to turn around and leave. I went on to the road to the airport and saw at the last turnoff that there were cars parked on a small road further away. I decided to go there as well. As it turned out, that spot was at the end of the runways, perfect for some action shots. The show was to start at noon. At 2pm the first planes took off. 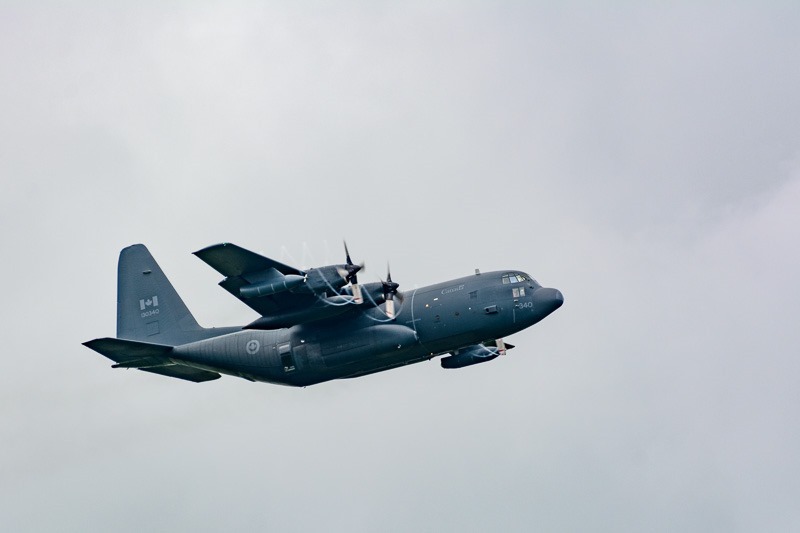 They started with a Hercules Carrier, one that I see from time to time fly over Winnipeg. For a beginning of the show, I thought it was not too overwhelming. 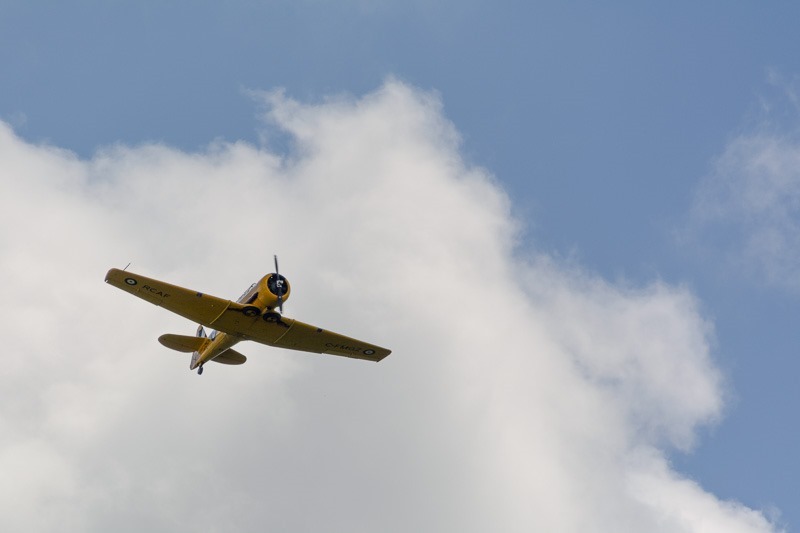 Seeing planes in a show that you see flying over your house is not really exciting. Then a plane from 1938 took off. 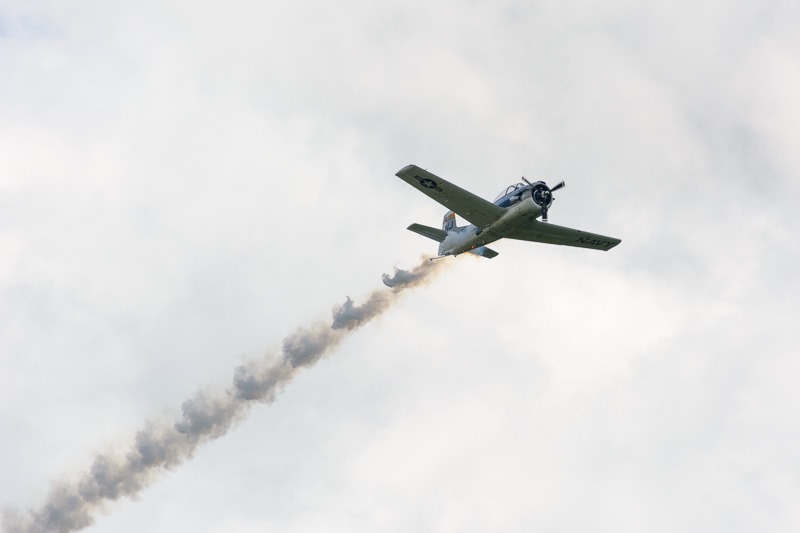 The Stinson HW-75X didn’t do many acrobatics, but I expected that. 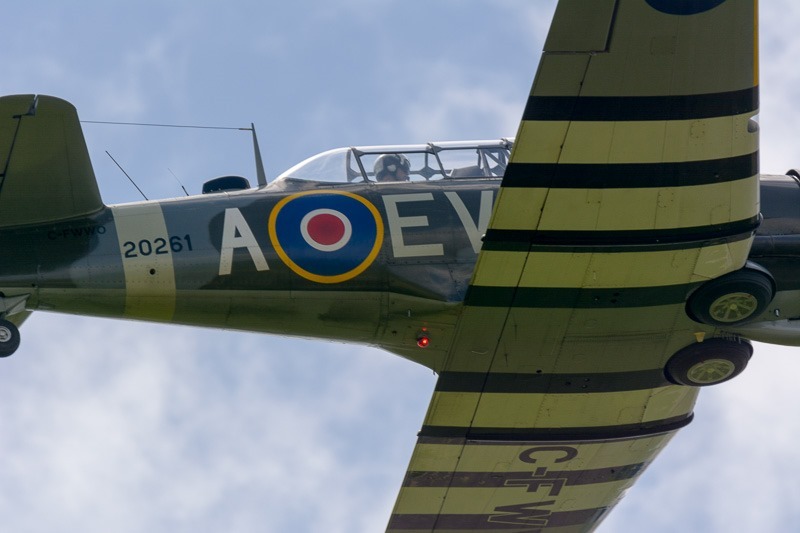 You don’t overstress a plane of 78 years old… It was nice to see this old cuckoo still flying, though. Soon it was accompanied by this other airplane. At first I thought it was a plane from WWII, some research it showed as made in 1942. This North American AT-6C has seen combat in WWII. Together they did a series of flybys and fly-overs, without going into serious acrobatic flying, something you would expect in an airshow. Next up was a small, funny looking plane. A Pitts S-2B from 1986. Decked out with nice paintwork and a huge canister of smoke . It looked that this plane (or its pilot) had never flown in a straight line in all of its life. From loopings to rolls and spirals, even a stall, high up in the sky was on the menu. 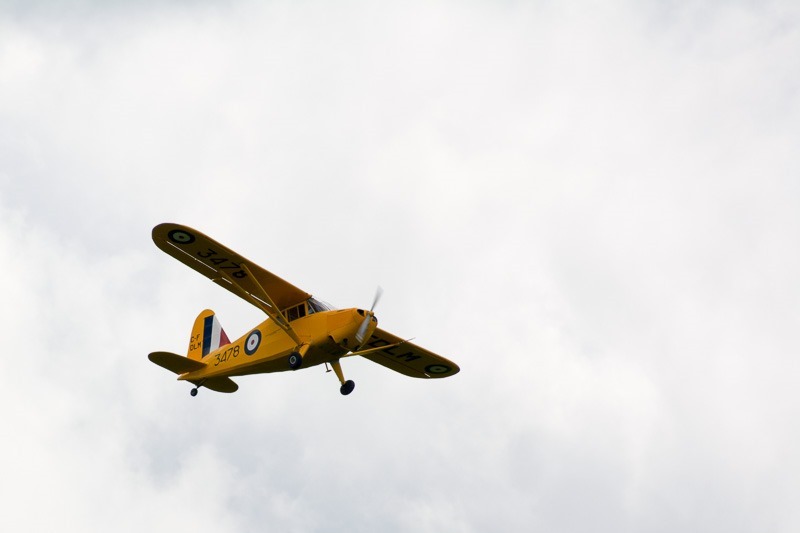 Then the pilot would seemingly regain control, I bet he never lost it in the first place, and dive down to the landing strip in a break-neck speed. In the above shot, the pilot managed to miss the landing strip and take off immediately again. This plane was clearly made for acrobatics and certainly didn’t disappoint. At certain moments it looked as if there was no control at all over the movements of it, although I am sure the pilot never lost a second of his control. My stomach would have protested. 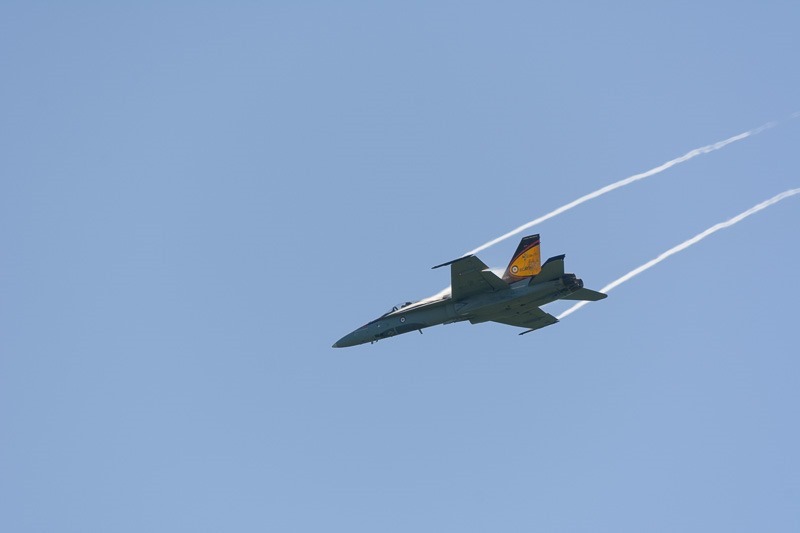 Then came the heavier material with a modern jet called the CF-18. As a kid I lived near a military airbase in Holland, one that you cannot see up close on any Google satellite photo. At that time, the then current jets passed the sound barrier on every Thursday afternoon. 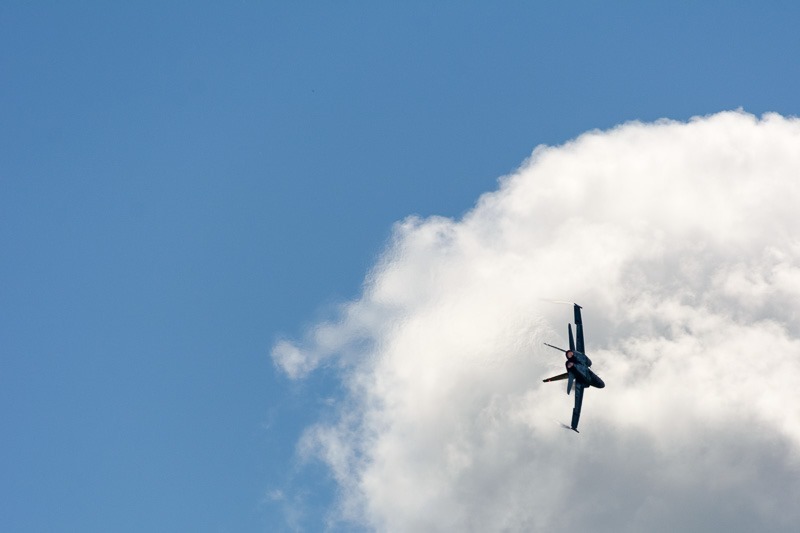 I kind of expected this CF-18 to do the same for the show, but… no, it didn’t. Well, I’m not going to make a physics class here .